In this past June’s issue of R journal, the ‘neuralnet’ package was introduced. 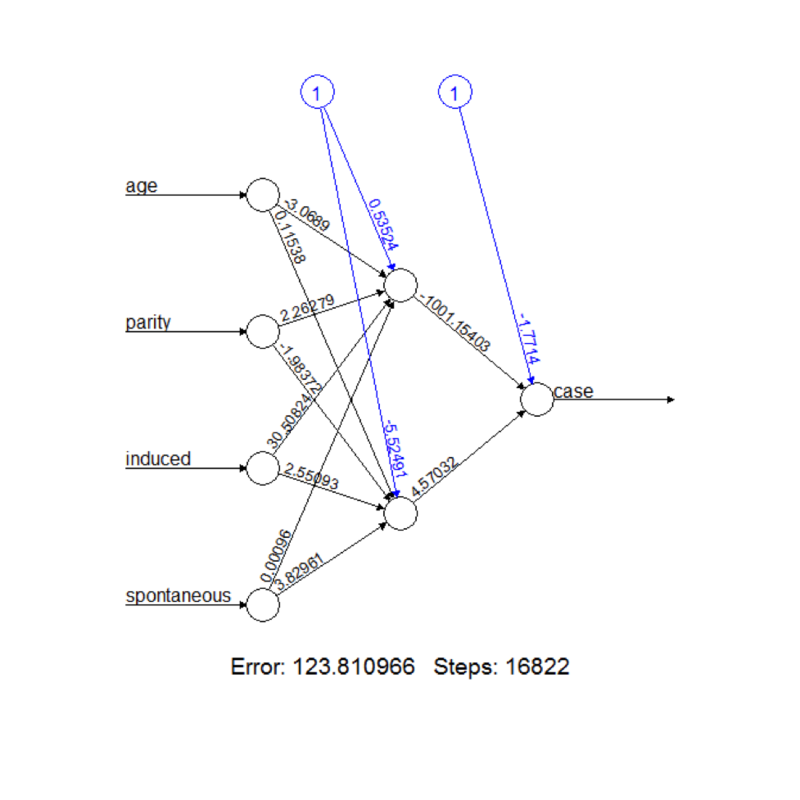 I had recently been familiar with utilizing neural networks via the ‘nnet’ package (see my post on Data Mining in A Nutshell) but I find the neuralnet package more useful because it will allow you to actually plot the network nodes and connections. (it may be possible to do this with nnet, but I’m not aware of how).The neuralnet package was written primarily for multilayer perceptron architectures, which may be a limitation if you are interested in other architectures. As can be seen below, the output weights correspond directly with the visualized network. While this tool may be more difficult to interpret with more complex network architectures, I find this simplified version very useful for demonstration/instructional purposes. Example: The weight for the path from input ‘age’ to the first hidden layer is -3.0689 (age.to.1layhid1) which can easily be found in the network diagram. After all inputs feed into hidden layer 1, the weight associated with the path from hidden layer 1(1layhid.1.to.case) to the output layer (which along with information from the other layers of the network will give us the classification of ‘case’) is -1001.15. There are many other options avaiable with the neural net package, I encourage you to read the article referenced below for more details. # as the ith regression parameter in regression models.